We're into the holiday season, and, like every other cancer, and especially metastatic cancer patient I know, I am saddened by the death of Elizabeth Edwards, and find myself contemplating mortality and my possible time allotment. Before Thanksgiving, we lost a vibrant voice on Inspire.com, in Australia, to her MBC. Shortly after Thanksgiving, I lost a dear friend locally to the same. Like Elizabeth Edwards, she decided that the chemo they held out for her was not worth suffering through, and chose to live her last days without chemo side-effects. Her funeral is this Saturday. I can count on one hand the funerals I have attended in my lifetime, but I will be there at hers, to show my support and love, for her and to her family. 2 days ago, the writer of a blog I follow passed away quietly from her MBC, after struggling for weeks with her lungs. Another dear blogger posted this week that she lost a member of her MBC support group, in Canada. Not feeling like a very survival-conducive season. My dear doctor was on the news yesterday morning, interviewed about metastatic breast cancer and the passing of Elizabeth Edwards. He was fabulous, of course, spoke with clarity and confidence, as though he were used to being in front of a camera. I see him again just after Christmas, and after my crappy visit last month, about which I did not blog, I really need a break from the office. I realized though, that I can take a break from seeing him, but I don't think I can take a break from having my power port flushed. I would really like to not go to the office at all for a couple of months, but that's not going to happen. I am going to take a break from the Zometa. I think more and more they are realizing that problems with osteonecrosis to the jaw are not as rare as they thought, and this month's treatment will be #10 for me. I had originally bargained to do a year, then go to quarterly, and this is close enough. January brings a deductible to meet, and even after it is met, I cannot afford the monthly cost of the treatments. I'll discuss it with my doctor. The 9 treatments I've had thus far, combined with the aromatase inhibitor, Femara, have worked just as they are supposed to, and my last scan was good. This is turning into a boring blog post. Sorry. Last night as I was falling asleep, I thought of several things to write, but today they are no longer in cranial residence. I think where it leaves me, besides sad for the families and the loss of friends, is ogling the idea that a good scan today doesn't mean it can't spread tomorrow. And to reinforce the notion that I may be a hoarder, I spent time yesterday worrying about what will happen to my stuff when I'm gone. Hoarding from beyond the grave, yet too tired to do anything about it now. I'm almost too tired right now to cry over these recent deaths. I did have a little cry today over feeling so tired and financially helpless, brain scattered and constantly hungry lately. Half the weight I've gained this year, it seems, has gone straight to my neck and chins. 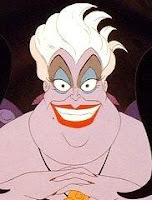 I look more and more like Ursula the Sea Witch with every passing trip to the scales at the doctor's office. I expect to awaken any morning now and find my face a lovely shade of pale lavender. I am thankful, this Christmas season, however, that my voice is still holding up. I can still hit the high notes, and plan to be somewhat a germophobe for the next two weeks, as I have a fabulous solo line in one of our Christmas songs. A fellow choir member commented to me last week that my voice seems to be fuller this year. I think it may be all that extra chin room.